Marcia drove the first 85 miles while I wrote diarios and then I drove the remaining 50 miles south and east to the very tip of Norway. With driving at 42 mph on these windy 2-lane roads, it took 3½ hours. It also took a little longer because I wanted to pull off the road and see two of the picturesque seaports we would be missing. 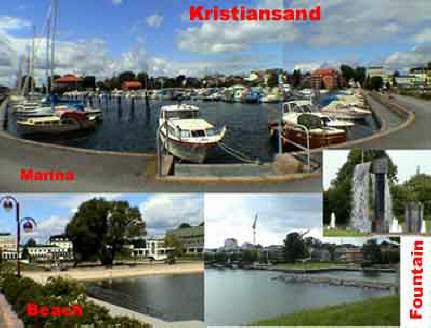 This area is called Sørlandet and it has these characteristic “white towns” of houses all painted white. 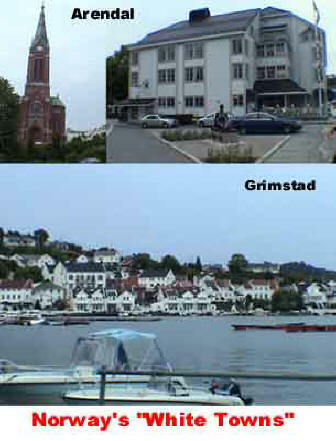 At 8 PM we went through Arendal (the oldest town – 1723) and at 8:30 the little town of Grimstad. 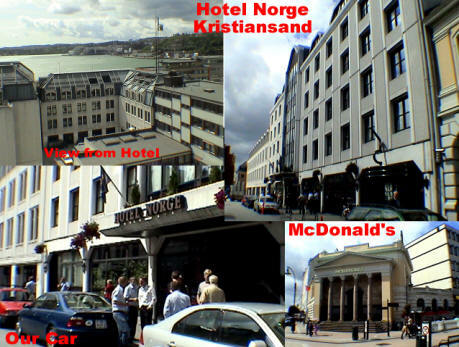 Finally we arrived in Kristiansand at 9 PM and to the Rica Hotel Norge [Dronningens gate 5, +47-3-817-4000,] which the last hotel booked for us. It was in the center of town. We learned that Dronningen means Queen. 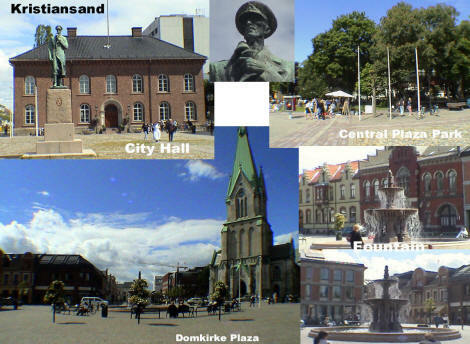 I hadn’t run yet so I went at 9:30 and ran down the main pedestrian street called Markensgate and around the town looking for good places to have dinner. I found three and let Marcia choose which she liked. She was tired and figured pub food was OK for tonight so at 10:20 we went into Phileas Fogg (a chain) [Markensgate 10, +47-3-802-2828]. We sure had pub food. I had a local beer, Christiansand Byggeri after first having a Guinness. I had potato skins and a bacon cheeseburger. 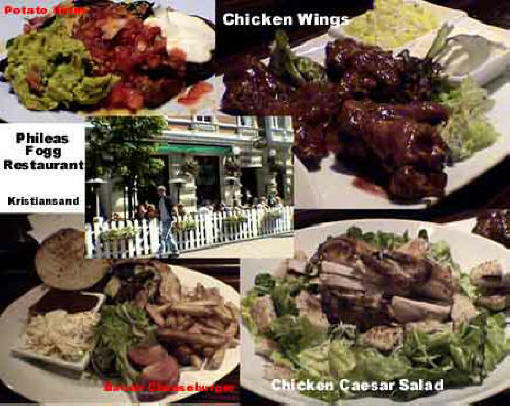 Marcia had chicken wings and a chicken Caesar salad. It was all very good. We wandered back to the hotel passing the most ornate columned McDonalds we have ever seen and went up to the 8th Floor lounge area of the hotel. I spotted a European English edition of Time magazine and sat a read almost the whole thing. Guess I was a little hungry for some Americana. Marcia gave up and went to bed and I worked on photos for a while and got to bed at 3:45 AM. I woke up at 9 AM and 10:15 and declared my cold was gone. I was just sick of it. By noon I was on my run through the town to the “old town” section and back to the water where the marina, beach and fort were. After I finished, I visited the central park near the Domkirke (main church) where there was a large group of children singing with a large crowd listening. I couldn’t understand a word but it was cute. 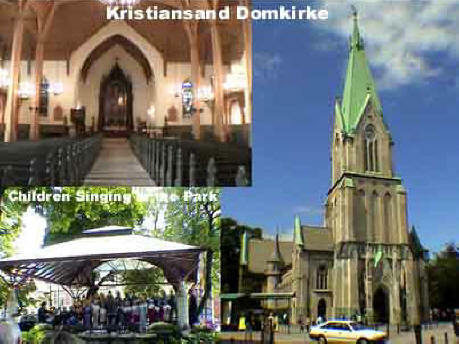 I walked across the park to the Domkirke and went inside. 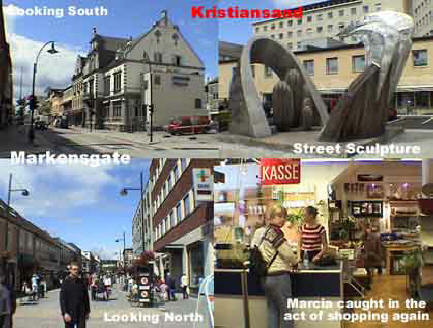 Kristiansand is the capital of Sørlandet and was founded by Christian IV (like Oslo) in 1641 and has become the 5th largest town in Norway. 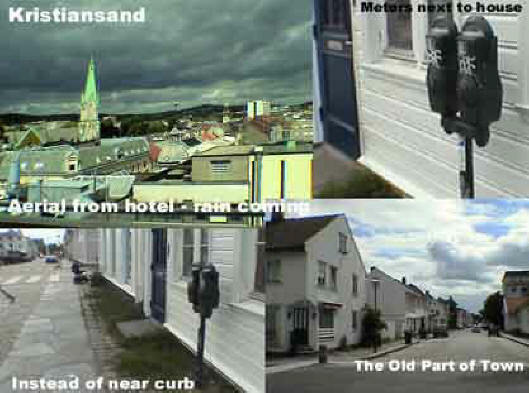 It was laid out in a strict grid pattern known as Kvadraturen (quad). Christian IV wanted a defense here so he built the fort called Christiansholm Festning in the year 1667. I found Marcia after she had her lunch and we checked out of the hotel at 1 PM. I found a place to do email and sent out Diario #4. 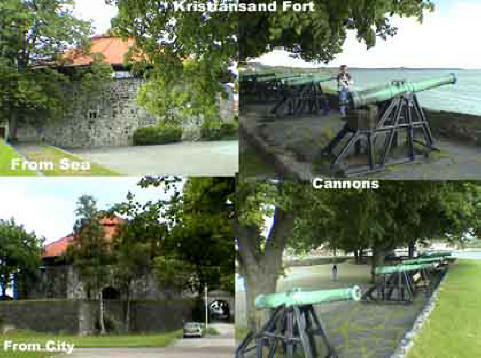 At 3:00 we then drove down to the old fort and went around the grounds that had large cannons aimed out towards the sea. There was a battle here in 1807 to drive off the English ship Spencer. 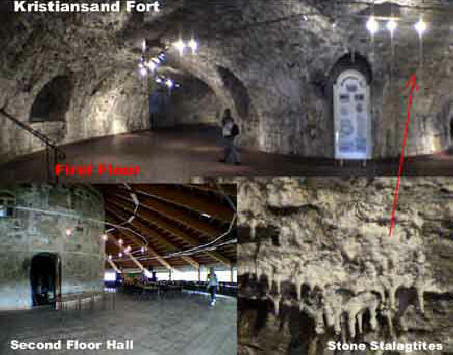 We went inside and the first floor was certainly medieval with drippings from the ceiling that looked like stalagmites (or stalactites) but when we got to the second floor we saw that it was all modernized and they were practicing for a music event to be held there. By 3:30 we were ready to head out and I drove the 75 miles up the coast to Austad. 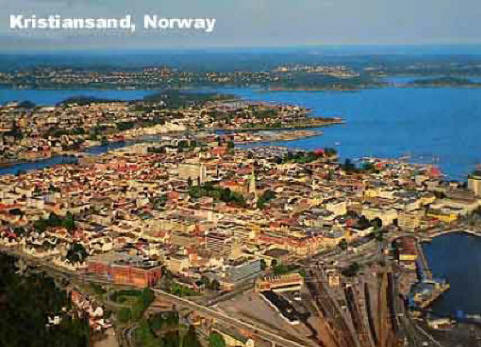 At 5:30 we took a rest stop and Marcia drove the remaining 75 miles north along the coast to the oil capitol of Norway, Stavanger [STAV-anger].